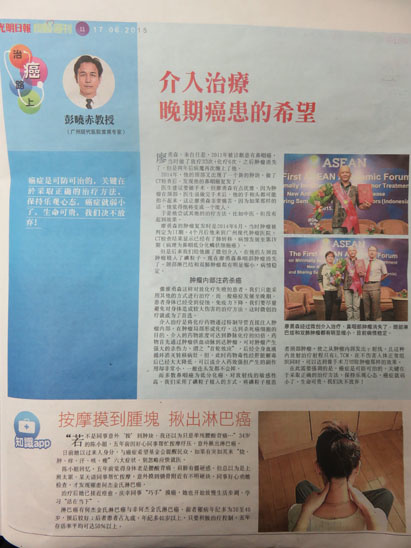 On June 17, 2015, Malaysian Guang Ming Daily reported a case of a nasopharyngeal cancer patient Effendi who got minimally invasive interventional therapy in Modern Cancer Hospital Guangzhou. After the therapy, his nasopharyngeal tumor disappeared. Malaysian Guang Ming Daily also introduced that the interventional therapy was the hope of advanced cancer patients. Effendi who came from Yogyakarta, Indonesia was diagnosed with nasopharyngeal cancer in 2011. Treated by chemotherapy and radiotherapy for many times, his tumor disappeared. Unluckily, the cancer returned two years later. The local doctor suggested him take surgery to remove the tumor in his neck. Considering the risk of having difficulties in head and hands movement after surgery, he hesitated. He tried many other therapies to treat his disease, Chinese Medicine for example, but they were not effective and his condition kept worsening. In June 2014, he was told the cancer had reached stageⅡ, and after 4 months he was diagnosed with nasopharyngeal cancer with lung metastasis (stage Ⅳ). He came to Modern Cancer Hospital Guangzhou, and took interventional therapy and 125I seed implantation. His tumor in nasopharynx disappeared; the neck nodes and the lung tumors obviously shrank. The report also introduced the minimally invasive therapy in Modern Cancer Hospital Guangzhou. Professor Peng Xiaochi, the chief expert of the hospital, said that patients like Effendi who failed to get good treatment effect from chemotherapy and radiotherapy had no choice but to adopt other therapies. Generally speaking, when the cancer patient was in advanced stage, his body had been invaded and his immunity declined. In order to avoid more body damages, minimally invasive therapy could be the first choice. The interventional therapy was to put the chemotherapy drug into the tumor via a special tube, and to form the chemotherapy locally to achieve the aim of killing cancer cells. The drug concentration on the tumor was 93 times higher than intravenous chemotherapy. With strong killing effect on tumor, the drug firstly reached to the tumor to kill cancer cells through the tumor-feeding artery, and then killed the metastatic lesions through blood circulation. Because the drug toxicity was detoxified by the liver, this therapy produced fewer side effects even without hair loss. Additionally, to nasopharyngeal cancer patients, Professor Peng said that most nasopharyngeal cancers were low differentiated. They were highly sensitive to radioactive rays. Therefore, it was suggested to use 125I seed implantation. After 125I seed was implanted into the neck tumor, it radiated γ rays inside the tumor with an effect range of 1.7cm. Thus, it could achieve the effect of surgical removal of the tumor without damaging the normal tissues. Professor Peng emphasized that cancer was a preventive and treatable illness. The key was to adopt a right therapy; meanwhile it was important to keep an optimistic state of mind and a never-give-up attitude.